Description of the performance Image of Mannheim. Review of »Blow!« in Ilsede. With a still photo of Mathis Künzler and Herma Auguste Wittstock. About the exhibition “Wir sind Paula” in Worpswede. About the exhibition “Wir sind Paula” (We are Paula) in Worpswede, and what may be the art in Herma Auguste digging up the lawn in her work “Paula”. Note: Herma is not from Hamburg. Review of the dance festival “Body & Eros” at the Venice Biennale. An excerpt from the work “In Between 2” is shown. 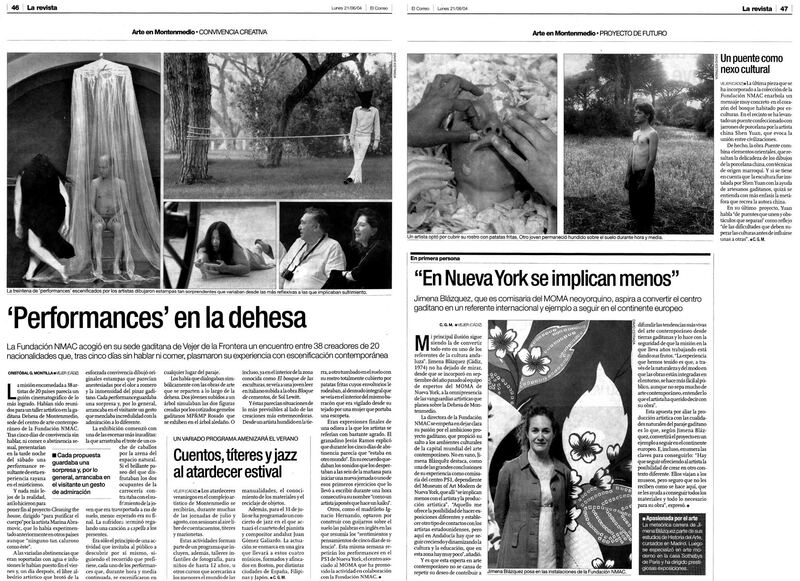 Spanish review of the exhibition by the Independent Performance Group at “Body and Eros” at the Venice Biennale. Announcement of the first exhibition by Künstlerhäuser Worpswede with new director Bernd Milla. Description of “Image Of Worpswede or Fresh Morning”. »Für die Performance-Künstlerin Herma Wittstock wird der eigene Körper zum Element der Kunst«. Article about Herma Auguste’s work on occasion of her residency at the Künstlerhäuser Worpswede. Descriptions of her works “Sundaybath”, “Hysterie” and “Swing Low”. Interview with Herma Auguste and excerpts from her works “Swing Low”, “Sundaybath”, “Hysterie”. Review of the master class exhibition at Braunschweig University of Art. Herma Auguste showed a loop of her last year’s works and the new film “Snot”. Review of the performance event “Gifted Generation”, HAU 1, Berlin, 20th/21st May 2005. Herma Auguste did “Sweet For My Sweet”. Susanne Maier: “Wer ist die Frau, die sich nackt aufhängt?”, in: B.Z. Announcement of the exhibition “Gifted Generation”, containing a photo of Herma’s performance »Sundaybath 2». Review of “Faxe Kondi: The unZipped Time Diary”, Futura, Prague, 7—9/2004. Herma Auguste showed “Movie Star”. Article about Marina Abramović’s Workshop “Cleaning The House” at Fundación NMAC, Spain. Photo (top left) of the performance “Reveal” by Herma Auguste Wittstock and Jens Kutílek amongst others.